Eilat Port, Israel's gateway to the South, lies on the northern end of the Red Sea. The port handles passengers on Red Sea cruises at its 1,200 m. modern terminal. The resort city of Eilat is only minutes away. 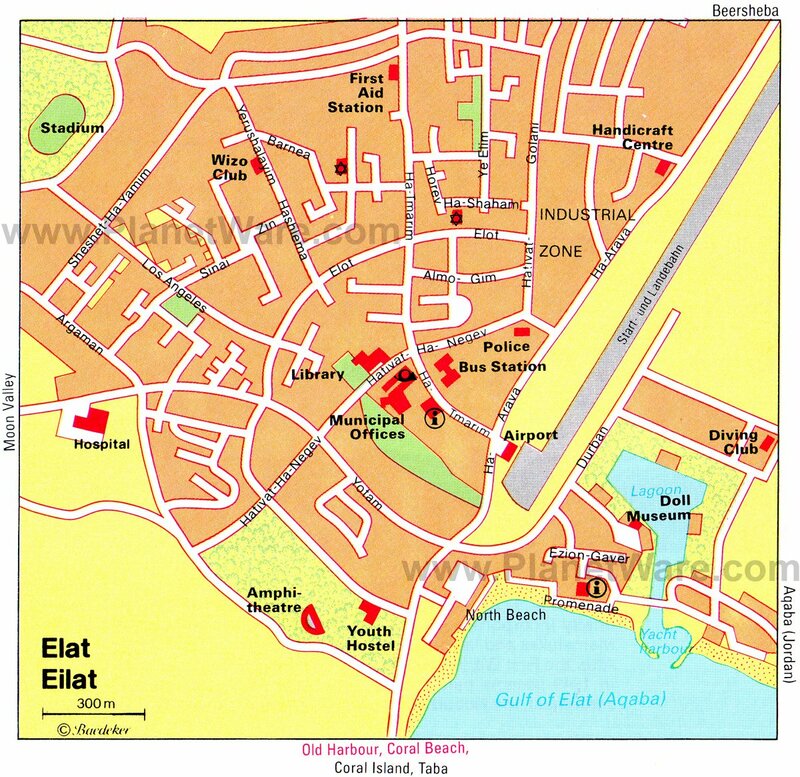 Eilat (Elat) is the main tourist attraction in Israel, and is Israel's most southern city. It borders with the red sea on one side, and the Arava (wilderness) desert on the other hand. Most of Eilat's business activity is tourism-related, and most of Eilat's residents' work is tourist oriented. Bird watching and ringing station: Eilat is located on the main migration route between Africa and Europe. Coral Beach Nature Reserve, an underwater marine reserve of tropical marine flora and fauna. Coral World Underwater Observatory - allows visitors to view marine life in its own habitat. The park, located at the southern tip of Coral Beach, has aquariums, a museum, simulation rides, and shark, turtle and stingray tanks. Diving: Skin and SCUBA diving, with equipment for hire on or near all major beaches. Scuba diving equipment rental and compressed air are available from a number of diving clubs and schools open all year round. Dolphin Reef, offering visitors an opportunity to swim and interact with dolphins, is also a marine biology and research station. Eilat is also a free trade zone, meaning there is no Israeli VAT (15.5%) in Eilat. The Promenade: Eilat's promenade stretches all along the Eilat coastline and the hotel strip. It is all booths maintained by local residents offering some "sharwals" (comfortable beach pants), "longis" and cheap Jewelry. When in Eilat you can't really avoid the promenade, and will find yourself walking through it and looking at the goods a couple of times a day. Mol Yam Shopping mall : a very nice mall, located right at the edge of the promenade. Shops are mainly Israeli clothing chains. The new Eilat shopping mall ("Hakenyon Hahadash") : is a nice little shopping mall right next to the airport Big mall – has just opened up, and is home to some Israeli clothing chains. Located at a few minute drive from the hotel strip, and sometimes offers better prices than Mol Yam. Shawarma – in Israel (unlike other places such as Turkey) Shawarma is made of turkey meat, and is usually served in pita bread along with salad, Tehina and pickles. The size of the pita may vary, and if you want to get your money's worth – look at the size of the pita before ordering, and ask for a serving without salad or pickles. This way you can increase the amount of meat you are getting for the same price, and save yourself the second serving.